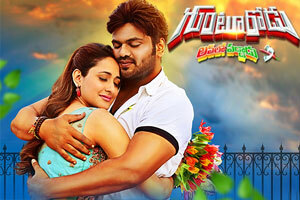 Manchu Manoj's upcoming film Gunturodu had to release in the second week of February. But it is the releasing in the first week of March. While speaking at a promotional interview Manoj revealed the reason for the delay in the release. He said that sufficient number of theaters were not available for release in February. Although they have considered the release film on February 24 at any given time, but may not be available from theaters forced them to postpone the release of the film up to 3 of March. He said that "We wanted the film's release on 24 February If we could not get enough theaters for release. But I did not feel bad about. Through grace God all films are becoming hits .. some of them long-term in theaters . So we could release the movie not before. " While speaking about Gunturodu Manoj said that "I wanted to be a commercial entertainer in several films. The film is about the heroism. Story is simple. Gunturodu can not control his emotions..whether is happiness or anger. He can not remain silent when some injustice done to him. that attitude lands him in trouble. the story runs in the background of these problems. When Gunturodu is glad he will play a theme song and enjoy the happiness. "